Comments Off on What is Acupuncture? Acupuncture involves the insertion of very thin needles through the patient’s skin at specific points on the body – the needles are inserted to various depths. According to WHO (World Health Organization) acupuncture is effective for treating 28 conditions, while evidence indicates it may have an effective therapeutic value for many more. 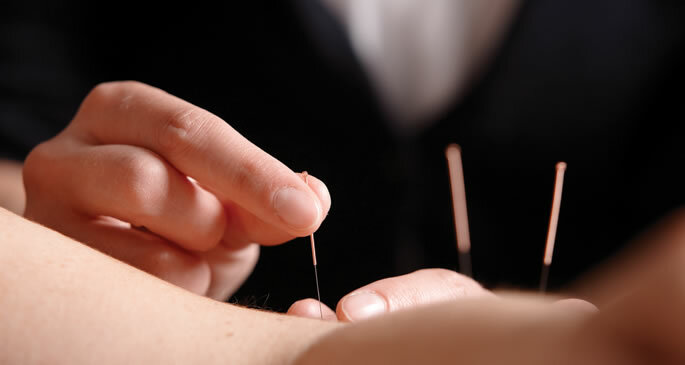 Acupuncture generally involves several weekly or monthly treatments. Most courses consist of up to 12 sessions. A visit to an acupuncturist will involve an exam and an assessment of the patient’s condition, the insertion of needles, and advice on self-care, herbal prescriptions. Most sessions last about 60 minutes. The patient will be asked to lie down, either face-up, face-down or on his/her side, depending on where the needless are inserted. The acupuncturist should use single-use disposable sterile needles. As each needle is inserted the patient should feel them, but initially without pain. However, when the needle reaches the right depth there should be a deep aching sensation. Sometimes the needles are heated with Moxa (mugwart herb) or stimulated with electricity after insertion. Once inserted, the needles will remain there for about twenty minutes. Traditional Chinese medicine explains that health is the result of a harmonious balance of the complementary extremes of yin and yang of the life force known as gi or chi. Qi is said to flow through meridians (pathways) in the human body. Through 350 acupuncture points in the body, these meridians and energy flows may be accessed. Illness is said to be the consequence of an imbalance of the forces. If needles are inserted into these points with appropriate combinations it is said that the energy flow can be brought back into proper balance. In Western societies and several other parts of the world, acupuncture is explained including concepts of neuroscience. Acupuncture points are seen by Western practitioners as places where nerves, muscles and connective tissue can be stimulated. Acupuncture practitioners say that the stimulation increases blood flow while at the same time triggering the activity of our own body’s natural painkillers.